Well more specifically, we finished first out of all of the teams. Winning!!! I have done a lot of races, and rarely have I come even close to getting a sniff of a win. Closest was a local 5k with a small field that I finished 2nd in... so this is really special! We were the fastest canoe - in fact not only did no other canoe beat us, only one kayak managed to. That was the product of a lot of work this year, we got out on the water quite a bit and did a canoe race early in the season (Canoe the Nonquon). 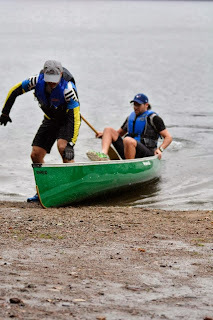 I get the impression the canoe is something most people just suffer through before getting to the stuff they're good at - for us it ends up being a place to make up minutes. From that point on we were the rabbits out in front for everyone else to catch. I would guess the nearest team was at least 2 minutes back, maybe more at that point. This year there was a run from the canoe to transition - about 1.5km. My buddy was in hammer mode, I was in "holy crap my heart rate is through the roof" mode. I slowed us down a bit, but that's the nature of the team event, you're only ever as fast as the slowest guy! Having a partner with a similar ability level is key. Oh and one you won't kill in the canoe. Rocks and roots, which would have been challenging enough without the rain. But it rained all night and all race - everything was soaked, there were huge puddles of standing water everywhere on the bike course. Streams, even! Several of them! 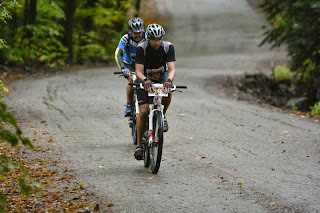 But my buddy and I have done Paris to Ancaster year after year, so mud is no stranger... we hiked the bike when we had to, plowed through what we could, and hammered the rest. I doubt we had the fastest bike of the day, but we were steady and most of all didn't let the conditions bother us. Just another challenge to add to the "Adventure". The team dynamic kicked in - he's faster in the technical stuff, I'm faster on the road sections, so he waited for me a bit and I waited for him a bit. 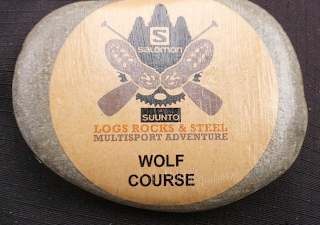 I loved this run - the trails were great, and very runnable (unlike the previous course where you literally climbed up portions!). The first half was the more challenging of the two - I slipped on a bridge that was soaked and slimy - but the second half was an almost flat run to the finish. With about 2km to go I was still expecting some sub-4:00/km runners to blow through... it happened last year! I knew we had a pretty good lead going into the run (no other bikes were visible when we went into transition) but you never really know how good the folks behind you are. But then I dared to say "I think we could win this thing!". We upped the pace in the closing kilometers as my buddy found his extra gear. Finally we came out to a road section - I kept looking over my shoulder expecting someone to pop out of the woods and chase us down, but it never happened. One last nasty puddle and we cross the finish line as the fastest team. We had definitely won the all-male team category, the only question left was whether we were the top team overall. There were wave starts, so some of the teams that weren't all-male teams (co-ed, masters, parent+child) started in other waves. There was still a chance someone would finish behind us on the road but pip our time. One team looked close - but when the results were finally posted we were right there in black and white at the top! Winning is awesome! I have a niggling feeling that the teams that beat us last year didn't show up, but you can't ever control who shows and who doesn't. We put together a great race that drew on our experience and lots of time in the canoe targeting this race, and ultimately we were rewarded. Feels great! Congratulations!! A win over three challenging and technical events in horrible weather conditions! Sounds like you and your buddy are a great match to overcome all the obstacles.